Preheat oven to 350°F. In a medium bowl, whisk together maple syrup, soy sauce, sesame oil and chili powder. Pour over salmon filets and marinate in the fridge for at least 10 minutes. Heat a large oven-safe skillet over medium heat. Add canola oil and place salmon filets in the skillet, skin-side down. Cook for 4 minutes. Spoon filets with any remaining glaze in the skillet or left over from marinade. Sprinkle filets with sesame seeds. 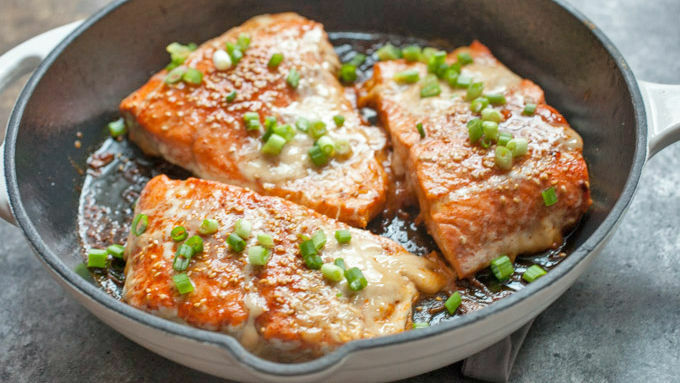 Move skillet to the oven and bake for another 6-8 minutes until salmon filets are cooked through. Remove filets from oven and sprinkle with scallions. Serve immediately while warm. Be sure to use pure maple syrup for this recipe. If you use maple-flavored syrup, the sugar in it will just burn. Be sure to buy skin-on filets so the fish is protected a bit from the direct heat of the skillet. For some reason people are intimidated by fish. I think this might be because it can be expensive to buy good fish, but it’s also really easy to make a delicious fish dinner, even if you’ve never done it before. 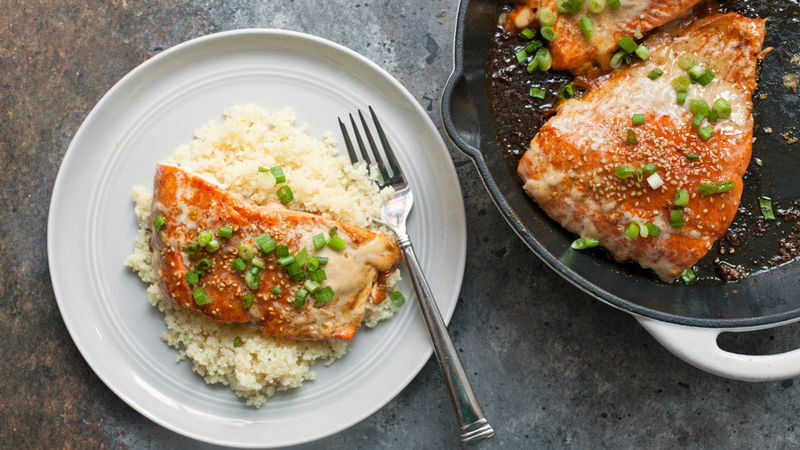 Case in point: this maple chili salmon dish has a fantastic combo of sweet, savory and spicy flavors that makes it incredibly addictive. It looks pretty impressive on the plate, too. But it has just a few ingredients, and you only need one pan, so there’s actually not a lot of fuss involved! Start by preheating your oven and whisking together the ingredients for the chili-maple-soy glaze. Pour it over your salmon filets and let it sit for a few minutes in the fridge. For the best results, let the fish marinate for at least 10 minutes, but no more than an hour. This one-pan salmon starts on the stovetop and finishes in the oven. Start by heating an oven-safe skillet over medium heat. Once it’s hot, add a drizzle of oil and add your filets skin-side down. Cook them for 3-4 minutes. As the salmon cooks, spoon the glaze over the filets. Before you transfer the salmon to the oven, sprinkle the fish with sesame seeds to add some great texture. Roast the fish for 6-8 minutes until the fish is just cooked through and flakes apart easily with a fork. To finish the salmon, spoon any remaining glaze from the pan over the top, and garnish with fresh scallions for a pop of color. You are going to love this dish. I like to serve it with a simple starch like rice or couscous. It’s a really tasty and delicious (and easy) way to add some fish to your menu! For some reason people are intimidated by fish. I think this might be because it can be expensive to buy good fish, but it’s also really easy to make a delicious fish dinner, even if you’ve never done it before. Case in point: this maple chili salmon dish has a fantastic combo of sweet, savory and spicy flavors that makes it incredibly addictive. It looks pretty impressive on the plate, too. But it has just a few ingredients, and you only need one pan, so there’s actually not a lot of fuss involved! Start by preheating your oven and whisking together the ingredients for the chili-maple-soy glaze. Pour it over your salmon filets and let it sit for a few minutes in the fridge. 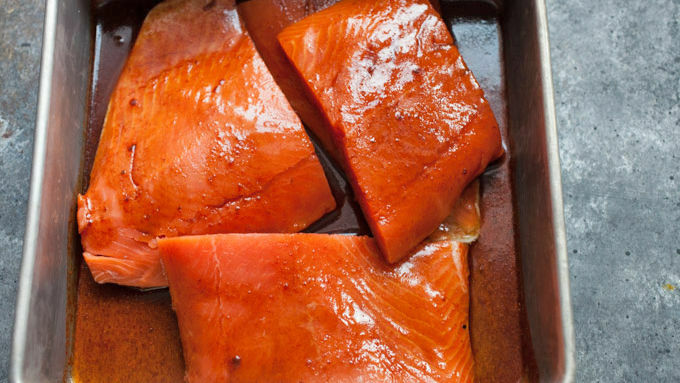 For the best results, let the fish marinate for at least 10 minutes, but no more than an hour. This one-pan salmon starts on the stovetop and finishes in the oven. Start by heating an oven-safe skillet over medium heat. Once it’s hot, add a drizzle of oil and add your filets skin-side down. Cook them for 3-4 minutes. 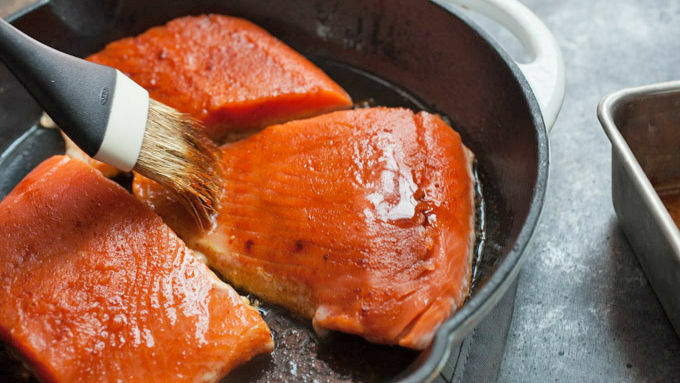 As the salmon cooks, spoon the glaze over the filets. Before you transfer the salmon to the oven, sprinkle the fish with sesame seeds to add some great texture. Roast the fish for 6-8 minutes until the fish is just cooked through and flakes apart easily with a fork. To finish the salmon, spoon any remaining glaze from the pan over the top, and garnish with fresh scallions for a pop of color. You are going to love this dish. I like to serve it with a simple starch like rice or couscous. It’s a really tasty and delicious (and easy) way to add some fish to your menu!